Restaurant Patio Enclosures made with clear vinyl will protect your restaurant's outdoor area from rain and wind while keeping the al fresco dining atmosphere. Custom made to your specifications using only the best marine grade vinyl and hardware. Clear vinyl roll up and down curtains are easy to drop down when you need them and rolls up neatly out of the way for temporary or seasonal protection. Tie-Downs will allow these curtains to withstand wind gust of 70mph, using the optional side fasteners or zippers will keep your space more air-tight. Easy to install and use with our rope and pulley system they can be raised up and out of the way when not needed in minutes. Keeping your customers comfortable outdoors will ensure a great dining experience and keep your tables full rain or shine . 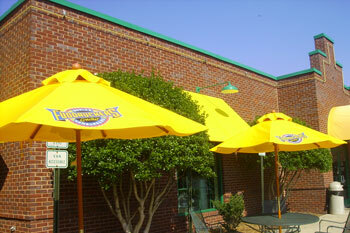 Restaurant Outdoor Sunbrella Shade Curtains and Commercial Umbrellas can help shield customers from harsh sunlight, providing shade on hot summer days. Clear Vinyl Enclosures can provide protection from rain and wind and keep the indoor area warm on cool days. Sunbrella Outdoor Roll-Up Curtains for restaurants and commercial locations can be adjusted to roll up at any height as needed to keep your customers comfortable on sunny days. Awntex mesh is available for shade curtains to shade the area without blocking any views. All made with marine grade hardware and premium outdoor fabrics. Custom made to your specifications. Outdoor seating offers benefits that make your restaurant an attractive proposition for more types of diners. Large groups, for example, enjoy patios because they can relax and order multiple rounds of drinks and food at their own pace. Many of the best restaurants and most exciting bars offer outdoor seating, so when the weather doesn't cooperate, keep your outdoor seating open with Clear Vinyl Roll Up Curtains, Sunbrella Roll Up Curtains and Commercial Patio Umbrellas.